Who ever said beans were bland, anyways? Seriously y’all. There is so so so much flavor packed into this chowder. There’s just something about a homemade white sauce with the flavors of the veggies and the stock. So rich, so simple…just down home, “roux goodness,” y’all. We enjoyed this meal, as you see it. No other bread, no other side dishes…it was so filling and so satisfying. And while I’d love to call it a “one dish dinner,” I’m not going to because it uses 2 large saucepans in the cooking process. 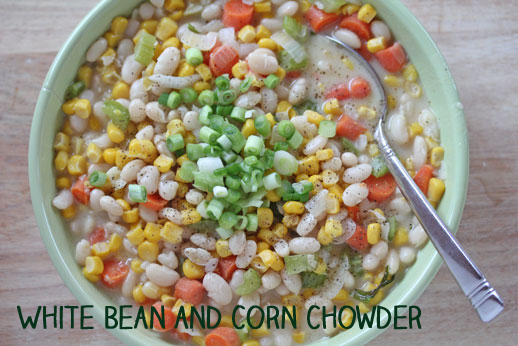 So…we shall just call it “white bean and corn chowder”…or a really inexpensive meal that you can throw together with the veggies from your fridge, beans from the pantry, and homemade chicken stock from the freezer. So glad that this chowder disproves that myth about beans! Cook the beans as directed on the package. In a large saucepan, melt the butter over medium-high heat. Stir in the onion, carrots, celery and crushed garlic and saute for a few minutes, until onions turn clear. Quickly stir in the flour and let cook until slightly browned. Remove from heat. In another saucepan, stir the corn and chicken stock together, bring to a boil and then simmer for 10 minutes. Then, pour the stock and corn into the other saucepan with the white sauce, whisking as you pour to prevent lumps. Add the cooked beans to the chowder. Return the entire mixture over the heat and bring to a boil and let it thicken as it boils. Slowly stir in the milk and let thicken. Season with salt and pepper to taste. Serve White Bean & Corn Chowder with sliced green onions as garnish. Disclosure: This post is part of a sponsored campaign with Hurst Beans. Recipe, thoughts and experiences are my own.